The source was impeccable: the BBC. The news was incredible: Italian cavalry had charged British airborne troops holding the Ponte Grande bridge. In the middle of WW2, could it possibly be true? 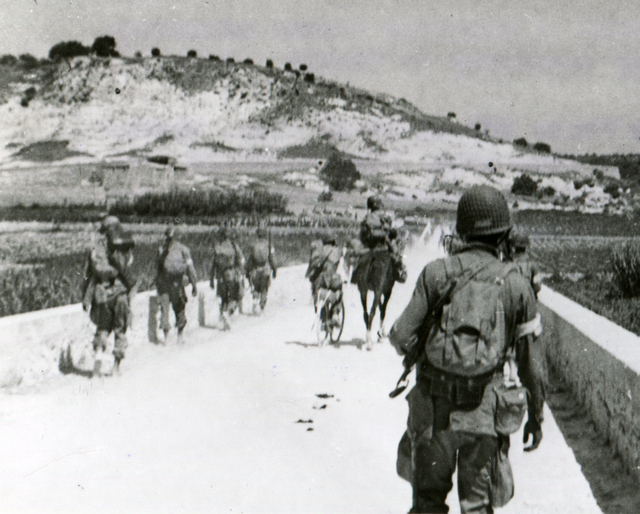 American soldiers of 82 Airborne Division march under Sicily’s scorching sun, 11 July 1943. They can be identified as paratroopers by their armbands and baggy uniforms. One lucky man rides a horse, perhaps taken from Italian cavalry. The thunder of hooves, clods of earth flying, weapons flashing in the sun, men screaming battle cries, the shrieks of stricken horses. It’s not a scene from the battles of Agincourt or Waterloo, but from the battle for Sicily in World War 2. The bridge mentioned above was the Ponte Grande bridge [map] just south of Syracuse [map] in Sicily. The bridge was the primary objective of British Operation Ladbroke, which was the opening airborne assault of Operation Husky. Husky was the codename for the invasion of Sicily by both British and American forces, each in their own sector of the island. The British dropped glider troops in their sector, and the Americans dropped paratroopers in theirs. The Ponte Grande bridge was seized and held for many hours by about 80 British glider troops from 1 Airborne Division. The Italians recaptured the bridge, but it was then in turn recaptured by British seaborne forces. The relieving troops did indeed come from 17 Infantry Brigade. These facts are not in question. What is astonishing is mention of an Italian cavalry charge. No other official source mentions a cavalry charge in Operation Ladbroke, and no personal account does either, memorable though such a thing would have been. It also seems highly improbable. The advent of the machine gun had long since made cavalry charges suicidal affairs. Even in their heyday cavalry charges were only truly effective against infantry loosely formed out in the open, where the shock and mobility of mounted men broke formations and slaughtered infantrymen piecemeal. But the British glider troops were dug in behind steep embankments, with a river at their backs. Any Italian cavalry that managed to survive long enough to reach the river would have had no shock impact and no room to manoeuvre, and would have been cut down. Also, the British had captured a pillbox, and sabres are not known for their efficacy against concrete. Clearly there was no Italian cavalry charge as described in the broadcast. So how did the BBC come to report a charge at the Ponte Grande? And if there was no cavalry charge at the bridge, then was there a charge against airborne troops somewhere else in Sicily? “The commanding officer of XII Corps ordered a mobile group, … comprised of a Blackshirt battalion and a squadron of cavalry, to counterattack in support of some strongpoints that had been surrounded but were holding out. Both of these accounts tally in placing the action near Licata [map] in the American sector of the invasion. The personal account also makes it clear that the charge was not a deliberate and planned piece of military tactics, but an impulsive and desperate move by men trapped in an ambush. To those who subscribe to a rigid code of military honour, the charge may well seem heroic. Many Italian soldiers that day, all over the invasion zone, fled or surrendered when under no particular threat at all. By contrast, this cavalry charge is an instance of Italian soldiers, caught in a hopeless situation, who did not surrender, despite facing almost certain death. To a modern civilian sensibility, however, it may seem a pointless waste, when surrender under the circumstances would have been equally honourable, and would have left no widows and orphans. So how did this Italian cavalry charge against American forces come to be described as a charge against British glider troops at the Ponte Grande? The answer may be that it was caused by a global instance of Chinese Whispers. Press reports of the time seem to show an incremental evolution of the story. Although it was in no way his fault, it began with the reports of Roderick MacDonald. MacDonald was a dashing and intrepid Australian war reporter, who worked for the Sydney Morning Herald. He was the only newspaper journalist who landed with the glider troops in Operation Ladbroke. He reached the Ponte Grande, witnessed the fighting, and was captured when the Italians retook the bridge. He was later rescued by a British patrol. He quickly wrote up his experiences, and special efforts were made to get his dispatch sent out of Sicily for publication. His work was pooled, and his dramatic story of the fight for the bridge made headlines all around the world. Several newspapers then added a short round-up of news from other sources or other reporters onto the end of MacDonald’s pieces. Sometimes it was not immediately clear that the additional pieces were not by MacDonald. Even if the reader deduced they were not by MacDonald, the pieces were adjacent, which made the additional reporting seem to be about the Ponte Grande. “Allied parachute and airborne troops became scattered in the high wind, and were unable to attack their objectives in full strength. They captured them, but could not hold them for long. Later, they contacted Allied infantry and regained their objectives. One unit was charged by a regiment of cavalry, but rallied, and routed men and horses. It is possible that all three paragraphs above are about the US paratroopers who landed inland from the American beaches, but only the last paragraph is specific. Certainly both US paras and British gliders were “scattered in the high wind”. The Italian cavalry may well have been ambushed by just such a group, as the American paratroopers were so scattered that they turned up in the most unexpected places. It is worth noting that glider soldiers were not paratroopers, as they arrived by glider, not by parachute, although both were airborne. “Throughout the night before the land invasion I could hear grim little actions going on in the darkness as units fought toward their rendezvous. Blockhouses were captured, barracks shot up, patrols machinegunned and wiped out, and most of the area SE of the tip of the island, on which seaborne forces landed later, was thrown into panic by these deadly attacks. The “I” of the first paragraph is MacDonald. But only readers who noted that MacDonald was not the Exchange Telegraph’s Algiers correspondent (who presumably never left Algiers) would know that the second paragraph did not come from MacDonald’s eye-witness account. So how did “a famous British unit” come to be involved in an American encounter? Presumably the closeness on newspaper pages of the Licata and Ponte Grande stories led them to become entwined in the mind of some reporters and editors. Perhaps there was an equally confusing press release. The evolution of this telling is a remarkable story of a tale repeatedly mis-told. It’s nowhere near as remarkable, however, as the fact that, in the middle of a modern war, a group of Italian cavalry mounted a charge against American paratroopers armed with automatic weapons. For other stories about Operation Ladbroke, see here. This entry was posted in All Posts, Archive Documents, Operation Ladbroke - Sicily 1943, Veterans' accounts and tagged 1 Airborne Division, 82 Airborne Div, Gliders in Sicily, Operation Husky Sicily 1943, Operation Ladbroke Sicily 1943, Ponte Grande bridge, Roderick MacDonald. Bookmark the permalink.